A discussion of assumptions one might be tempted to make. With examples taken from my own research. Assumption: The name of a child indicates the name of the parent. Question: You run across a person named John Robert Green II. What is his father's name? Answer: You can not assume it is John Robert Green. Sure, there is a strong likelihood. But there is no law, in the United States at least, that sets rules on how to name a child. Sometimes a child can be named the II where an Uncle or other relative was the first. Or you can have parents with a strange sense of humor. You can have a John Robert Green II who is the son of David Alexander Green, with no John Robert in sight. I wouldn't be surprised if somewhere in our country there exists a Leonard Part VI. For privacy reasons I will not indicate the example from my own research. Second in a series of posts. Assumption: Documentation that an individual lived somewhere in time indicates they lived there before or after that moment in time. Every document is a snapshot in time. Except in rare occasions, they don't tell you what happened before or after that snapshot. In April of 1927 my grandmother married in Oakland, California. In October of 1927 she divorced her husband, and returned to St. Louis. She didn't miss appearing in the 1927 directory. She appeared in the 1928 directory under her maiden name, and her married name. She did appear in the 1929 directory, but only under her married name. She returned to her maiden name by the census in 1930. Remember: Every document is a snapshot in time. Be open to learning something important happened between two snapshots. I was looking at the entry for one of my wife's ancestors on somebody else's Ancestry Family Tree. As you can see, the person entered her birth date as 04.11.1817. And her death date as 17.07.1915. From the death date, it is clear they are using the European system of Date.Month.Year. There is no 17th month. The birth date could either be in April or November. If you glance down at the Timeline - Ancestry assumes the user was using the American Month/Date/Year format. Oops. If I were able to copy the whole entry, you'd notice that the Ancestry Timeline gets the death date correct. Which means the software program is coded to recognize the existence of both methods, but only uses the European method if the American method returns an error. I used to be a computer programmer, and I don't think I'd have coded it this way. Note: I went to my own family tree and tested the interface. There is no clear way to indicate which method you are using, and the software made the same mistake when I entered the same dates. However, the person who created the entry below did make a mistake in entering the date of birth. They cite FindAGrave as a source, which cites her death certificate. Both sources have her date of birth as November 14th. A simple typo, but a reminder to look at the sources. Further Note: It was mentioned that this programming error may only exist if one uses periods to separate the numbers in the date. So I tested it with the more traditional /s and the same thing happened. First in a series of posts. While one might say, "of course they aren't, no one would make that mistake," this is what makes me cringe most often when watching Who Do You Think You Are. The researcher finds the grandmother in a household in a census, and tells the celebrity the parents in the household are their great grandparents. Perhaps their great grandparents are dead, and these are actually the grandmother's uncle and aunt? I assume (hope) the researcher has conducted additional research to verify the information, but they don't mention it on television, leading some viewers perhaps not to ask that question in their own research. I have distant relatives who have looked at the above US census record from 1870 for the Denyer family, and recorded in online databases Amanda, Sherwood, and Ida as children of Ebenezer and Sarah, despite them being a decade older than William and McAlpin. They are actually the children of Ebenezer's brother, Samuel Denyer, who died in 1861, and his wife Zarelda, who died in 1867. (As a side note, several of the names in this record are actually middle names. McAlpin, for example, is my great grandmother, Margaret Jane McAlpin (Denyer) Vanevery. 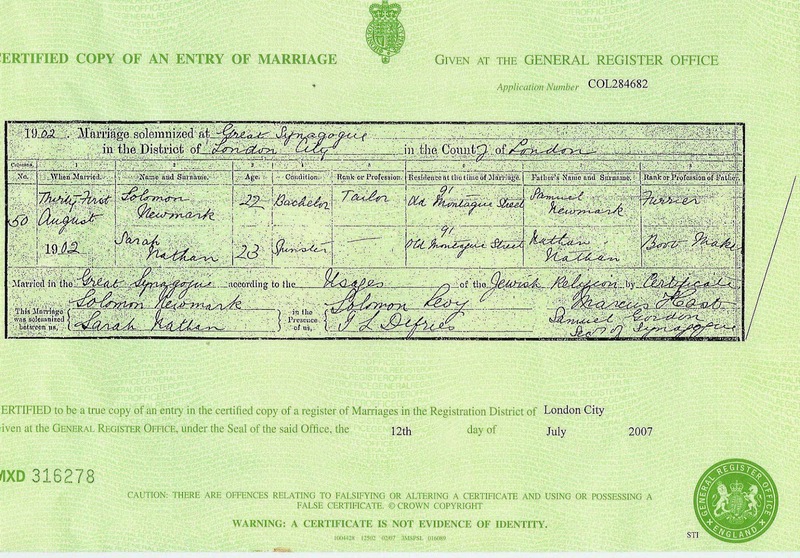 Above is a marriage record from the UK General Register Office. The marriage occurred in London in 1902. If I asked you to tell me the name of the Father of the Bride, your answer would be "Nathan Nathan." I'm pretty certain I know what happened. The clerk asked the bride for her maiden name, and then asked only for her father's given name. Unfortunately, it appears Sarah followed the Jewish custom of using her father's first name as her last. Perhaps as an affectation, since it was no longer common in the 1900's. The 1901 UK census indicates the family name was Sandler, and Sandler appears on some documents as Sarah's maiden name. Just because there is a government stamp on a document doesn't mean the information is necessarily correct. Record the information in your database, and cite your source, but always be open to discovering new, conflicting information. How Many Sarah LNU's Are in Your Genealogy Database? If you have one that is your ancestor, have you looked recently to determine if there are more records online that might lead you to her surname? Go look for one - you might be surprised! LNU is an acronym for "Last Name Unknown." Using the acronym, instead of leaving the surname blank, facilitates finding these mysteries in your database to research at a later time. LNUs, by the nature of surnames in Western European culture, are almost always female. I had one Sarah LNU - however, she wasn't related to me. She was the husband of my 2nd great grandfather's business partner, Max Wieselman. I had entered Max into my database as an "Associated Person." (iFamily chart to the left.) Max and my 2nd great grandfather, Selig Dudelczyk (he changed his surname to Feinstein), worked as horse shoers/blacksmiths together, and were co-inventors of a modification to a fire hydrant. When I first visited the cemetery where Selig and Anna, as well as several other paternal ancestors are buried, I parked a fair distance from where their plots were, planning to walk the rest of the way. At my feet, when I got out of the car, was the headstones for Max and Sarah. I had only entered their names and dates from the tombstones, and hadn't conducted any additional research yet. While he was my ancestor's business partner for a decade, I had no other reason to conduct any research on him or his family. The first thing I did this weekend was look up their death certificates at the Missouri Digital Heritage website. They were both there, as well as the certificates for two sons. According to Sarah's death certificate, her maiden name was Ottman. However, Max's death certificate was more interesting to me. It stated he was born in Zhitomir, Volhynia. The same town Selig's brother Julius had for town of origin on his manifest. Did Selig and Max know each other in the old country, or did they meet each other in St. Louis? Census records indicate Max immigrated in 1884, a few years prior to Selig. It looks like at some point I may need to conduct some more research on the Wieselmans. However, the information I want is likely in Ukrainian records.